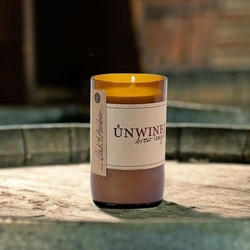 Reflect on the carefree moments long after the beer is gone with Unwined's Brew League Candles. Crafted using signature relaxing scents, all natural soy wax, and reused beer bottles, this new "brew" is a spin on an old favorite! 5 O'Clock Somewhere is just what you'll need after a long day. Tropical pineapple, orange, and cranberry mixed perfectly with subtle yet enticing notes of peach schnapps and vodka for a candle that is bold and sweet. Let the earthy aroma of sage and lavender relax the body while the lively aromas of orange and amber awaken the mind. Oak & Amber is subtle and enticing.